The family consisted of divorcee Margaret Hodgson and her four children: Margaret aged 12, Janet 11, Johnny 10 and Billy 7. The paranormal activity started one night, when the two girls were in bed, a chest of drawers started shuffling forwards, towards them. Their Mother went upstairs to see what the commotion was, the girls were told to get back into bed and stop messing about. With that, the chest of drawers suddenly lurched forwards. The Mother pushed it back in place only for the chest to immediately move forwards again! The family was kept awake all night long with strange noises and knockings. The following morning, exhausted, the family went into the neighbour's house and described the night's events. Vic Nottingham the neighbour went into the house to see if he could explain what was going on. He too heard the noises, and says that the knocking followed him from room to room. The phenomena continued, the family experienced knocking on the walls, Lego bricks and marbles were thrown at the family, furniture was moved, fires would ignite and extinguish themselves spontaneously, and Janet would be thrown out of bed, and made to levitate. One of these incidents was witnessed by two passers by, who stopped in amazement to watch Janet levitating horizontally in her bedroom window, whilst toys were swirling around in the air behind her. A priest and a medium were called in. They could do nothing and the knocks and unusual movements of objects continued. On one occasion the mother was so scared by the events and was at such a loss of what to do that she called the police. When they arrived on the scene they witnessed a chair lift up in the air, which as it came to rest shot 4ft forward across the floor! The police even wrote a statement to this effect. The Newspapers were called and a senior reporter for the Daily Mirror went to interview the family. Their patient waiting was finally rewarded with a host of flying objects, including a pan that hit the photographer on the forehead. 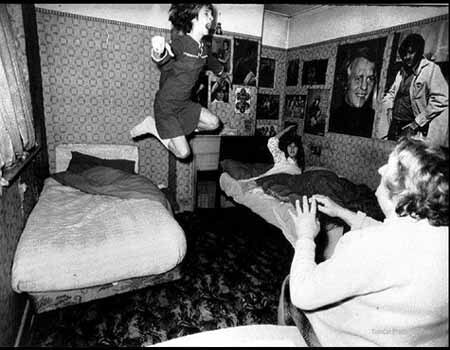 In a series of well known photographs journalist Graham Morris photographed her being levitated out of bed by an unseen force while her sister looked on. On one occasion the sheets on Janet's bed tried to strangle her and it was only her muffled cries that caused her mother to come to her aid. Mrs. Hodgson was at such a loss of what to do that she called the police. When they arrived on the scene they witnessed a chair lift up in the air, which as it came to rest shot 4ft forward across the floor! The police even wrote a statement to this effect. It was then suggested that paranormal investigators should be brought in. And so began an intensive study that was to last for many months with paranormal researchers, Maurice Grosse and Guy Lyon Playfair they recorded over 2,000 unexplained events at the house. Electronic equipment would occasionally refuse to work inside the house but operated perfectly as soon as it was taken outside. Pools of water would suddenly appear around the house. Late one evening, when the children were asleep in their rooms and Maurice Grosse was downstairs compiling his day's findings, he was disturbed by the sound of Janet screaming. Maurice ran to the foot of the stairs only to see the 12-year-old apparently being dragged through her bedroom door by an unseen force she was hauled down the stairs and dumped unceremoniously at Maurice's feet. One morning when Guy Playfair was working at the house, he heard a "tremendous vibrating noise". "I really thought someone was drilling a great big hole in the wall of the house," he says. "I tore into the bedroom and there was quite a commotion. The whole fireplace had been ripped out. "It was one of those old Victorian cast-iron fires that must have weighed at least 60lb. It was so heavy even I couldn't pick it up. During the latter months of this haunting, the phenomena took an unexpected twist when one day the family was in the living room and suddenly a dog started barking they didn't have a dog! Maurice decided that if the entity was able to produce a bark, perhaps it could be coaxed into speaking. He began asking questions and to his amazement the entity answered! The answers came from Janet, the voice was strange, deep and guttural, and very much sounded like that of an old man. Investigation showed that to produce such a sound, the voice would have to come from the false vocal cords situated deep in the throat. To speak in this way is painful and damaging, and to speak in this way for any length of time is said to be medically impossible. The voice was recorded on many occasions, Janet was seemingly possessed, she was made to take a sip of water and have her mouth taped up. After the voice was heard and recorded, she would be un-taped and would spit out the water. The spirit claimed to be that of a man called Bill who said that he was the previous occupier of the house, and stated that he had died of a brain hemorrhage in an armchair in the living room. A recording of the voice was played to the deceased mans son; he confirmed that the voice was his fathers. The paranormal activity at the property lasted for approximately 2 years it ceased as suddenly as it had started. The barrister, Mary Rose Barrington, who reviewed the case on behalf of the Society for Psychical Research, is in no doubt that the investigators did a thorough and honest job. She re-interviewed and cross-examined many of the witnesses and double-checked the evidence. Nothing she found suggested a wider conspiracy. Equally, the 30 or so other witnesses including police officers, journalists and passers by all seem convinced by what they saw, it would also have been physically impossible for the two young girls to have faked some of the evidence such as ripping out the fireplace, or making a chair levitate in front of police officers? The son of the previous occupier was adamant that the voice was that of his Father. Janet now aged 41, and eager to keep details of her present-day life private for fear of attracting ridicule, she is adamant that what she experienced was a genuine paranormal entity. "I know from my own experience that it was real," she says. "It lived off me, off my energy. Call me mad or a prankster if you like. Those events did happen. The poltergeist was with me and I feel in a sense that he always will be."